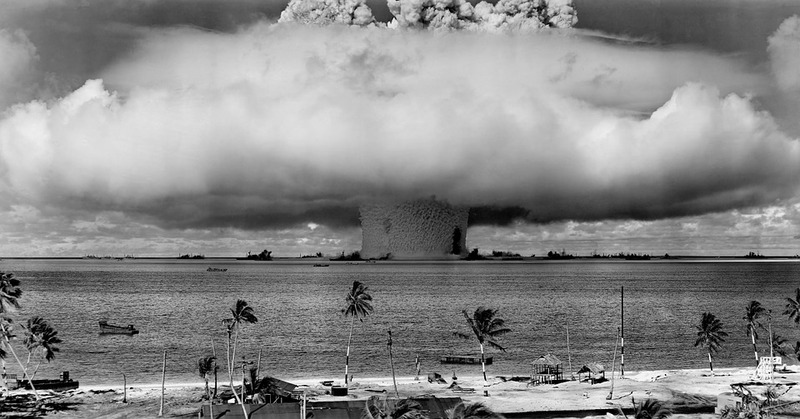 Nuclear war usually appears in debate rounds about as often as Hitler: with absurd frequency. In this post, Harrison finishes discussing another technique for responding to nuclear disadvantages. Read part one here. As others have noted, it’s generally accurate to say that if the original sources of arguments heard the disadvantage, they would “laugh uproariously.” Source intent is often thrown to the wayside and trampled as debaters try to connect “political capital lost” to “can’t pass trade deal” to “experience recession” to “China challenges America” to “nuclear war.” Generally, no reasonable interpretation would accept the alleged links between sources, but some judges are willing to tolerate the gaps: even if the argument is incomplete and the opposing team argues this, the judges might default to thinking “well it may not be a strong link, but they didn’t 100% refute that slim possibility…”—even though debate rules/norms arguably require a higher burden of proof (so that people can’t just say e.g. “this conspiracy theorist says ______, so we should give it at least a slim possibility”). The ridiculous arguments’ reasoning chains tend to evaluate links in isolation while failing to properly evaluate the links together. Take for example the short string of “US-China relations worsened” => “China gets angry/desperate” => “China miscalculates nuclearly.” The internal validity problem is that each step in “relations worsened” (e.g. “diplomats insult each other,” “military standoffs,” “espionage”) tends to assume that nothing else is happening, when in reality policymakers can see the larger picture, and thus may choose better diplomacy rather than blindly following this path towards nuclear war. Put briefly (since my old article covers the idea), the ridiculous arguments say “there’s this super-slim chance that something horrible would be caused by the plan,” but ignore that an affirmative could also just say “there’s this super-slim chance that something horrible would be prevented by the plan—and the realistic benefits make that more likely.” This may or may not be an issue of internal validity (it’s complicated), but it still is important to mention. As Larry Smith extensively noted, these nuclear war disadvantages are undermining policy debate. When parents or peers see the absurdity that goes on, students are less likely (on average) to participate in policy debate (and perhaps debate in general). Additionally, it has tarnished the reputation of policy debate to the point that I am legitimately (albeit not “frantically”) worried that when I list my policy debate experience on my resume a potential employer might look negatively on it. Policy debate teaches very useful skills in addition to communication: research, decision making, deep analysis, etc. At least, that is what is learned in homeschool policy debate; in public school policy debate, there is an astonishing lack of common sense in policy analysis, as good arguments and topical research is cast aside in favor of absurd, canned generics that are nonsensically linked to suggest unrealistic conclusions. The actual merits of proposals are rarely debated, stunting topical education in addition to skills training. Again, Larry Smith provides much more detail and persuasion regarding the kritikal problems with accepting these absurd arguments, but the problems should be fairly obvious if you have seen the difference between homeschool and public school policy debate. The fact is, accepting these absurd arguments harm participation, competition, reputation, education, etc. Put simply, it’s time to stop with these absurd arguments: they are almost always irrelevant/wrong/invalid and are usually very harmful to policy debate. The real question is what to do about the arguments. The long-term solution to the problem is multifaceted, with a significant part of it being more community judges. In the meantime, however, people can discourage these arguments by actually beating them (and/or teaching others to beat them), making them less effective. To do this, I still recommend using my old article’s strategy as the primary response, but for added effect (and more long-term solvency) you can reference the framing argument made here.